> So will one bo forced to run Blades/Harrowstorm to proc "Darkness"? If that's the case, could you consider to just make Darkness increase damage the SW inflicts to enemies by 10% regardless of what powers are being used? Perhaps it could benefit allies too? What about tweaking Dark Revelry to be a 20% damage buff? > Just make it work on buffed power like Aura of Gifts from OPs Light (bottom) path, or Weapons of Light from DC Rightous Path, generally they are the same feature but for some reason SW got the weaker version. As devs may change the way powershare and bonding companions interact, it may be better if DR gets changed to a 20%dps buff, that way, if powershare ever gets changed, DR wouldn't be affected by that. As devs may change the way powershare and bondimg companions interact, it may be better of DR gets changed to a 20%dps buff, that way, if powershare ever gets changed, DR wouldn't be affected by that. in the long run it might really be a good change but a shortterm fix could very well be to change DR to buff Allies power by 20% of the SWs power instead if increasing the Power of the Reciever by 20% of their Power. This would increase the Powerbuffing SW has from about 6k (now) to about 20-25k after the change. in sum the templock then would have PoP 18%dmg buff, the new Capstone 20%dmg buff, a bit of debuffing (DT+feats), some AP/stamina boosts and the 20k power from DR which in total sounds quite nice to me. @balanced#2849 Just to be absolutely clear. You said you took everything Po9H currently gives and stacked it onto PoP. So that would include keeping the buff for 5 seconds after leaving the pillar and the new Po9H is an extra 5 seconds, making it a total of 10 seconds if you take 5 ranks? no, he only took those buffs 12+2% per point and buffed PoP with it fix. PoP will allways spend that buff towards allies 18% dps, 24% towards you. The feat Power of the nine has to be feated to gain that 5 second lasting buff out of Pillar, wich remains a good investement imo, if it works correctly. If it's that way then it's not an absolute improvement, since spending points on Po9H to not instantly lose the buff will be almost mandatory in most situations specially for temptation. I was hoping that with temptation I would be able to save some Po9H points to use instead on the improved critical promise and get a little damage boost. Fury might let go of Po9H, but people will have to get used to standing at one small spot. Perhaps making the radius slightly larger would make it less of a nuisance. Then just let your party know before hand if you have Po9H or not so they know how fast they need to move back to the PoP. True, you will have to take that feat anyway. It is too good to drop and Dark revelry with it´s puny powerbuff leading to 6-7% dps won´t hold against a 18% dps buff and is not worth that 15 points. If you go for pure dps (fury all-in) you will downgrade the groupperformance significantly imo. So as most feedback agrees on with the Eldritch Momentum change is that Combat Advantage is a meh buff, as it is already granted naturally in most of the content with correct tactical placement. The only thing this does now is being semi-useful in very specific fights like dragon turtle and tiamat. This makes it something that needs some work to keep up fulltime, and at least 15% is reasonable at a tier 5 feat. This would also make Darkness only boosting personal damage for the warlock be reasonable, as having both stacking might end up in being too much. So guys, in order to proc Darkness, will it be mandatory to use BoVa/Harrowstorm? If so then no one is going to take that feat, at least not me, no point soing so if it is tied to such subpar damage dealing powers. Since Templocks get´s a lot of aggro, the staminabuff was very welcome situationally and pretty nice esp. at lower levels. I´d like to see EM as a stamina buff as it is, who cares about the fact that I can hover arround? If you pick your boons correctly some classes can dodge endlessly like DC and CW and TR, by that taking zero damage. 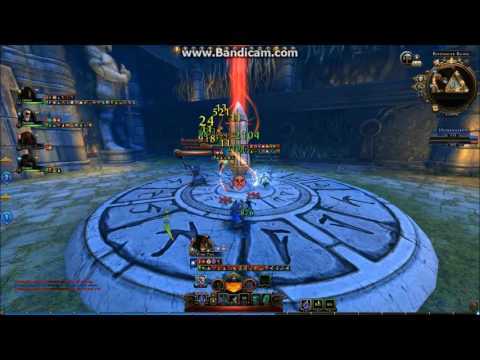 A staminbuff leading to a class hovering in PVP without attacking..noone cares since that build deals no damage and no heals, it´s a joke and you are not invulnerable by that. If endless Shadowslip is a problem , i´d say give dodges an internal cooldown because it is even more OP. I´d like to see EM buffed like an aura, a small staminagain for you being hit and a passive AP-Boost to other classes like 5% being healed (similar to Gift of Haste) to buff templocks utility. AP gain from DC and OP is pretty nice, nothing a warlock can hold against imo. By that Soul Breaker should be completely changed (noone ever picked this feat). About Darkness I am not sure, if I understand the change correctly? Darkness: Tooltip updated to mention Harrowstorm (functionality unchanged) "
10% personal +dps by using an encounter that noone uses? Harrowstorm is more like a tragedy, linking it with a tier 5 feat makes it even more tragic. If it´s a plain 10% dps boost by speccing into it and the usage of HS on top spends a 10% DR buff it is considerable. But I would not pick Harrowstorm, as long as it is not fixed (casting time/Animation). I would rather skip that HS/DR buff and give Vampiric Embrance a boost, like sharing temp HP with allies, to compensate the lack of mitigation (maybe 50% temp HP buff). 50% is not much considering the incoming hits these days. > in the long run it might really be a good change but a shortterm fix could very well be to change DR to buff Allies power by 20% of the SWs power instead if increasing the Power of the Reciever by 20% of their Power. This would increase the Powerbuffing SW has from about 6k (now) to about 20-25k after the change. > in sum the templock then would have PoP 18%dmg buff, the new Capstone 20%dmg buff, a bit of debuffing (DT+feats), some AP/stamina boosts and the 20k power from DR which in total sounds quite nice to me. > Thoughts about such ideas..
> Vampirice embrace - Curse Synergy, Provide damage increase ~20% (5% per rank), for 8s. (this work regardless which build tree). > Firstly, I prefer to reduce Debuff dependence within warlock.. Also curse mean, ~3 targets only.. And try hit marked/cursed target within crowd zombies/demons/etc. > In comparison to DC's, well it;s not good.. Plus unlike Buffs, debuff require to be applied with each new target..
> My proposal is to provide buff like effect, plus temptation Feat: Soul Bonding, would spread this buff to allies as it now heal and provide Temp HP. > Also, if you are not templock, you get benefits too. For example in boss fight, SB fury, >VE + DT + SS and you have increased dmg output. For Damnation, VE = buff own damage + soul puppets. > So I think PoP and PoNH need completely merging, and feat rework from a to z. > Murderous Flames - All fire based power( yes, all of them). should benefit from this feat, because fire based mostly are burst powers. > Creeping Death - replace with self damage boosting buff. > Reason. DoT of Creeping death is just not far from OK. For single target is great, but with each new enemy appearing in front of you, warlock had to build up new stacks..
> If fight is long, then this feat is brilliant, but usually fights don't last long, and feats DoT mechanic don't can't compete with other classes provided damage..
> My proposal is to change creeping death to selfbuff like rampaging madness, so when hitting enemies warlock would empower himself, regardless if using burst or DoT powers. > This would let to have same increased damage within fight, regardless if SW engage new or old target. > Scornful Curse heroic feat so it would - Increases the damage dealt Lesser Curse and Deadly Curse 10/20/30%..
> Such combo means, players could build up DoT based warlock, or burst powers based one. > Feat: Power of nine hells: Soul puppet cast t AoE , debuff toward enemies, which Increases the damage targets take from all sources by 2/4/6/8% for ~6s. > Note: debuff do not stack, and effect can be triggered once per 30s. (values of debuff effect and cool down are not finals). > Or: Soul puppet have chance to grant allies(SW included), temp buff: players attacks will also deal 10/20/30/40/50% of your weapon damage for next 4s. > Note: buff do not stack. and have inner cool down ~16s. > Feat: Soul Desecration; grant warlock ability to keep 2 soul puppets active at same time. > feat: Warding Spirits - While you have a Soul Puppet active, you take 2/4/6/8/10% less damage. > Note 2: it's like killing flames encounter mechanic. > Note: buff do not stack,. > Aura of Cruelty : You and all teammates within 50' of you gain 1/2/3/4/5% Life Steal Chance, Now also grants 10% Life Steal Severity and Resist ignorance. > Note: life steal severity important, but without decent resist ignorance, not much of healing you can get.. Plus this feat would give some benefits within pvp. > In addition aura of despair have chance, to deflect 3/3.5/4//10% of incoming damage. > Effect have inner cool down 15s. > Note: Mechanic work as reverse HR fox cunning class feature. Instead providing players 100% chance to avoid incoming hit, this suggestion is to provide chance. to make enemies miss. > Also provided values are not finals. > current: Striking Cursed foes has a chance to grant 1/2/3/4/5% of the Warlock's Max HP as Temporary Hit Points to allies near the Warlock. > Suggestion: remove ~5% of warlock max HP as temp HP. > Striking cursed foes - chance to grant temporal shield - 100% by players HP. lasting for ~15s. > Note: buff do not stack, and can't refreshed. > When struck you have a 15% chance to repel your attacker 1/2/3/4/5 feet and restore 2/4/6/8/10% of your Stamina. This only works within 20 feet. > Eldritch Momentum: , it's seppuku ritual by 100% assurance. > Proposal: Eldritch Momentum - by receiving hits from foes you have have chance to restore 2/4/6/8/10% stamina .. in addition grant 3/6/9/12/15% combat advantage for 4/5/6/7/8 seconds. > For now its enough..
> If anyone have ideas(reasonable ones) about certain changes within my proposed ideas, just let me know..
> p.s I wrote while I where in work (nigh shift), and where borred. > A critbuild will not suffer and the buff from PoP will be a dps-win (critseverity 180), wich will egalize the effect of OBC or simply beat it, if you replace that OBC with an siegemaster on top. > PoP 5%, Infantile Compensation 7% (after CD nerf), before IC was about 12% (maybe less). At 180% critseverity 5% becones ?% (at least more). If you count a 75% Creeping Death proc on top and switch towards siegemaster (+4% overall dps) you will outperform that OBC with a critbuild significant I think. > I really hope the buffs from Temp capstone and tier 4/5 will be sufficient, atm I think templock is unneeded. I have already around 150 crit severity and 90% crit chance. I absolutely did not base my obc on non crit encounters it would be a pure waste inho and some sort of exploit. It's ONLY use is/was always with POP non crit ticks. I always rushed mobs after tank aggro to put a pop under them and then move back a little protected by the 1s frame imunity. Let's says you have 50k base power alone, you do mspc/ to9g or whatever dunjeon with many ennemi on the ground, you rush a POP under them. With 20 ennemis it's 20 x 25000 power every tick ! Now, your power is buffed by dcs and whaterver and these ticks become just insane ! All my others encounters crit or most of them so they don't need obc ic. A non crit build based on obc would be a pure waste imho, only pop ticks non crit gave obc a sense. That's why i don't get your point, exept for pop/obc i already needed all the crit i can get. I can't see why players would not aim for max crit chance /severity even with obc. I never really checked crit % from others sws i beat in dps but it may explain why i beat them by so much if they think obc must be fully used with non crit, it's a mystake imho. So yes i will loose 20% or way more of my dps because i can hardly get more crit than i already have. There is no way in 9 hells that POP criting will cover this dps loss. I've seen so far 2 logs where owlbear cub represented 10% of the total damage of a SW, replace that with a +x% damage companion and make POP crit wih the dread you say you use and POP damage will go way up, POP not being able to crit is just a necessity to close the gap of gear between fury and damnation/temptation, i agree 100% that POP should crit and gear should increase the utility of each path. "The Damnation Warlock uses curses to aid allies, weaken foes, and corrupt the weak." "The Temptation Warlock bolsters his allies and siphons the life from his foes." => if you run a setup: Fiery Bolt, PoP, Killing Flames, then PoP will proc lesser curses on all mobs leading to Fiery Bolt AoE proccing creeping death with first use, same with killing flames. As well with other AoE encounters. I know there's plenty great PvE Scourge Warlocks that voiced up their opinions, to me, Pug Panther, this was being a Scourge Warlock mod 6-12a. This was the thing, the playstyle, the amazing survivability nobody was expecting to see, that was my thing. Sad part is, it won't ever be like this again due to all the PvP changes done, which nerfed Borrowed Time into oblivion but was major SW survivability part. @bloodyspamer I partially agree with some of the things you propose, but one was them was too important I couldn't resist. The resist ignorance buff part is the best. On a serious note though, I agree that the full functionality of Po9H should be merged into PoP, otherwise 10 points in damnation is still a must have on any hellbringer. They could put all of Po9H into PoP, and maybe reduce the time if they think it's too much, like making it 3 seconds at max PoP rank. Then for Po9H they could make it add a little more time to the buff outside PoP and also make it buff the puppet damage by 10% on targets affected by hellish rebuke or to targets inside a pillar. It would be nice, if Warlock's Curse would have a special, characteristic ability depending on which path you choose. I really like that Warlock's Curse will work for Allies when you pick Temptation and it would be nice if it would get a special boost for the other paths as well. Fury: If you apply Warlock's Curse to a target it spreads to all nearby enemies within 30'. Damnation: Your Soul Puppet deals X (100% ?) increased damage against targets affected by Warlock's Curse. P.S. : I really like the idea of Murderous Flames working for all fire-spells, Fiery Bolt would be devastating (like it should with this long cd). https://i.imgur.com/ET8nHoA.png A buffer-group in Tong with OP-DC-DC-GWF-SW (me) (85% crit). 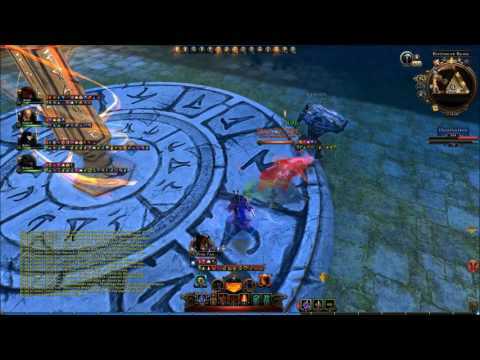 PoP 5% dps, IC 7% (after Cooldown nerf). 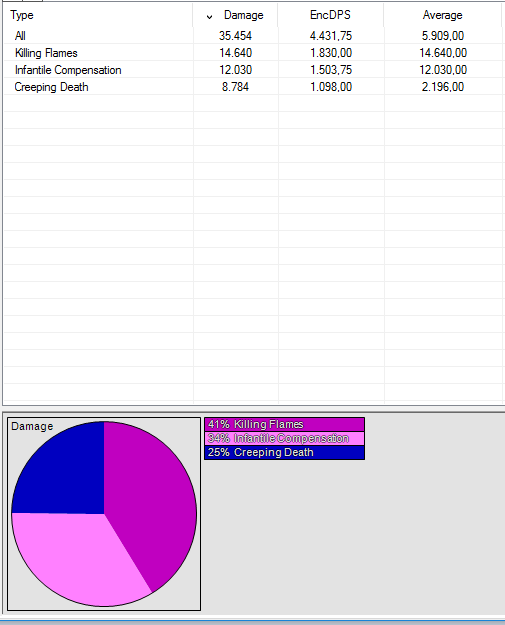 Before internal Cooldown nerf Infantile Compensation was about 10-12% from overall dps. Not more for a critbuild using PoP+Firy Bold+Arms of Hadar doing trash and PoP, WB+KF ons single target. In that specific run PoP dealt an average ammount of 26k damage, IC 78000 average proc. 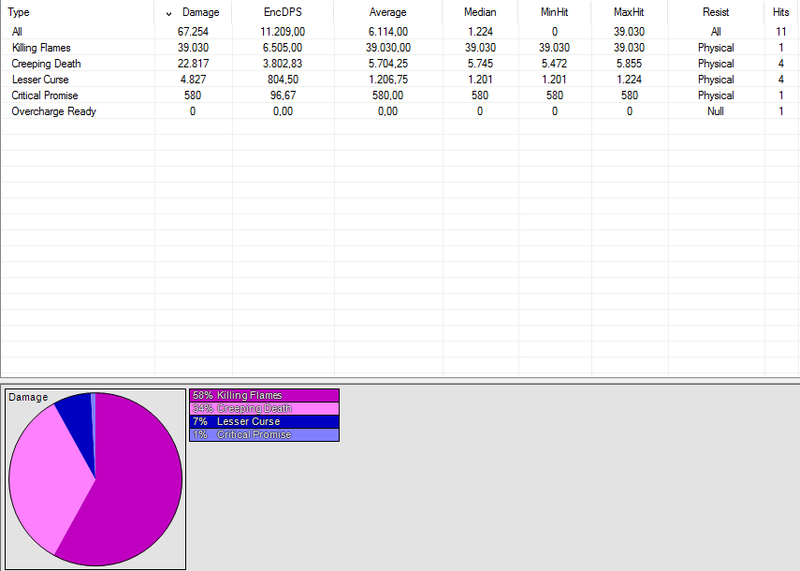 All in all that PoP will deal aproximately an ammount of 127000 damage in that calculation for each tic in mod 13 (if your DoT´s run out). Atm PoP dealt 26000 PoP +78000 IC on a buff group = 104000 damage, notice IC does not proc of every PoP tick atm (rate 1:2, due to nerf I suggest). This outnumbers IC procs for a critbuild. And my crit was at only at 85% that run. Now count a Siegemaster on top + 4% dps towards every source of damage. A 100% crit fury build will not lose any dps by that change I am pretty sure, it will be a significant dps increase, due to LC-synergy and constant Creeping Death procs, not to talk of that better companionbonus 4%. If you want PoP will be your "curse-machine" and lead to guaranteed 200k CD-bonus-procs (in that specific run) from encounter like FB and AoH due to LC showing up at once. Or did you ever achieve to apply a curse on every target of a group right from the start? I never did. Let´s make PoP a 50inch aoe please!! Notice a higher powerstat not only increases IC proc but also the damage of your crits. It´s all about crits and buffs in this game. No WC should not make allies deal more damage on soul bonding, aiding allies using curses is damnation job, temptation should boost allies whether there are curses or not involved. I understand you try to rely on the paragon tree descriptions, but I have to disagree with your opinion. Damnation as it is is solely focused towards personal damage, and in a later rework it should be fixed to function as a dps. I would love to see some cooler synergies with puppet, making it an interesting choice for a dps path. Maybe a synergy with encounters leading to puppet gaining buffs or using special attacks; synergies only working for damnation capstone. I also like the idea that @greyjay1 wrote about unique curse interactions with each path. Fury has its Brutal Curse, Temptation will have the ally buff curse, and maybe damnation could have some special curse around puppet. Hm, PVP...no clue, who cares about a sunken ship. ....and classes without like SW, Hunter, CW, latest victim DC, from wich SW looks like the weakest? SW relies on LS. LS is dead in PVP. So SW seems to be more dead than ever. But I don´t know and don´t step into PVP , too messed up. Devs desperately try to fix stuff but make it worse every mod, maybe they should buff warlock LS severity up to 200% in PVP to hand back the main source of defence. On HB obviously I slot PoP, then Arms of Hadar or Harrowstorm or Warlocks Bargain depending on the situation with my mid encounter being Killing Flames or if KF is no good then AoH, Hadar's Grasp or maybe Harrowstorm, really depending on who you have to counter, but its not like prior to mod 12b changes anymore, although first control on the rotation hits like a train because we do not have the PvP tenacity control resistance. I dont play SB much so I leave this to @paixnidiaris2 I believe he is the right man to speak about it. Although yes, Borrowed Time was my thing, after rework of HB I didn't played SB. I believe BT was nerfed into oblivion by 75% healing depression. Dark Prayer is buff for DR under 50% health, trust me it won't matter if you have it or not and while slotting it you would have to give up on different features. I use Shadowwalk and No Pity No Mercy most of the time or switch Shadowwalk if my opponents dont require rotations. Shadow Walk itself is defensive so I don't see point to slot thing like Dark Prayer, as a HB there's better defensive feature its Prince of Hell and you don't need to be below 50%, on SB you have BT and Shadow Walk too. There's no incentive slotting most class features sadly. Thank you very much for the deep analysis very instrutctive ! We don't have a tool to that end on ps4. Fiery bolt wouldn't be as devastating as you might think. It would just deal a flat 30% more damage (from a whole mess of small hits if hitting a large group). Unless they make the damage to targets around be 30% for all instead of being 30% equally divided, then it could be a really serious buff to fiery bolt. I don't know how fiery bolt ended up on target cap, but if you hit 4 targets with it you would be dealing over 100% more damage on them. Would be nice to see. As warlock stands now, probably wouldn't make it overpowered. I believe fiery bolt didn't exceed 10% of the warlocks' damage I used to see on my logs. Would be nice to try it out on preview. The bad thing about our AoE is that you are always limited to dealing maximum damage on at most 3 targets. Suggestion: If you target enemy foe, let Fiery Bolt complete casting and explode at the enemy location regardless if the target dies. Make the calculations of damage and curse synergy be made at the time you start the casting. This way it will explode and deal AoE damage when cast. Killing Flames has the opposite problem. This can be cast regardless if target enemy dies during casting. This being a single target spell makes this go to waste. Preferably this could work like Fiery Bolt does atm, canceling its casting time. Main problem is still Fiery Bolt being the biggest nuisance.